For the first time, eBay has decided to leave the rather safe realms of the internet and set up shop in London's Dean Street. For one week only and starting from today, 1 December, eBay has decided to rent out a real shop and fill it with brand-new goodies – all of which can then be bought online through its app. The shop has been dubbed a Christmas boutique by the online retailer and offers up a real browsing experience, with 350 items available to peruse in three separate rooms: His, Hers and Family – which really means, gadgets, fashion and toys. TechRadar went along to the shop earlier this week and spoke to Jody Ford, eBay vice president for mobile and fashion, about the high-street experiment where he explained: "We are trying to shift away from the perception that eBay is just an online auction and show people that there are many brands that use the site to sell their products brand new – and this shop is a great showcase for this." Another big reason eBay has decided to hit the high street now is because mobile phone technology is so prevalent that handsets can now be used as a tool to shop. 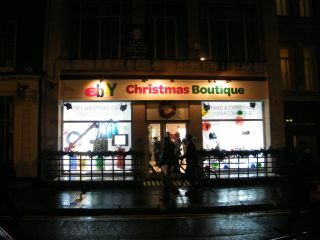 "We couldn't have created this boutique shopping experience without the eBay app and QR codes. The use of QR codes is essential to linking the shopping experience to the site and is and, alongside the app, is an easy way to buy stuff on eBay." Every product in the shop has been given a QR code and, according to Ford, there will be assistants helping out shoppers and making sure they have the eBay app installed and that they can use the QR codes effectively. This also means that the store has been kitted out with Wi-Fi. "10 per cent of all eBay purchases are made through a mobile device in the UK, so it makes sense that we utilised this in the Christmas Boutique," said Ford. And if you don't have a phone on you, then don't worry as there will be HTC tablets available in the store to use. If online shopping on the high street sounds like your thing – and has melted your brain just thinking about the paradox this could well create – the eBay Christmas Boutique popup shop will be on London's Dean Street until 5 December.